In 1973, a type of carp was imported from Asia with the goal of ridding U.S. ponds of unwanted parasites and improving the quality of the water. It worked, and then some. By the early 1980s, Asian carp started to appear in the Mississippi River and other large bodies of water. Decades later, millions of voracious, filter-feeding Asian carp are plaguing the Missouri River and its tributaries. The fish are known to damage or destroy ecosystems because of what they were first brought to the U.S. to eat: plankton and algae. And it has. The meddlesome carp are forcing native fish to compete for food and swimming space. Adult Asian carp can eat up to 20 percent of their body weight on plankton in a single day, and the four main subsets of Asian carp — bighead, black, grass and silver carp — can weigh anywhere between 20 to more than 100 pounds. On top of that, female Asian carp will lay hundreds of thousands of eggs each time they spawn, which can be several times a year. 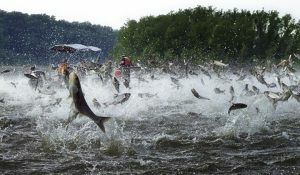 Outside of harming ecosystems, some of the Asian carp pose a direct threat to humans who skim the waters above on watercraft. Mason said the most dangerous encounters between boaters and Asian carp come on oxbow lakes, which are shallow, river-made bodies of water like Lake Contrary and Little Big Lake. “When you’re on a jet ski, the collisions aren’t good,” he said. Conservationists believe that it’s nearly impossible to completely eradicate the now-flourishing Asian carp. “Short of a disease wiping them out, we really don’t have an answer yet, which is the scary part,” Mason said. One option, however, takes into consideration the popularity of the fish in other countries. A company called American Meixi Fishing Industry is exporting the fish, using the same waters in which they have invaded. 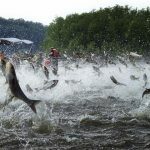 The Grafton, Illinois, business flash freezes thousands of pounds of Asian carp daily, then uses river and ocean freight to ship them back to their land (or waters) of origin. 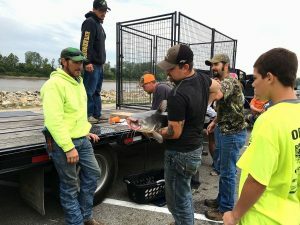 Back up the Missouri River to St. Joseph, fishermen have started to capture the carp to use as bait for more enticing, native fish, like catfish and gar. Mark Zinn can be reached at mark.zinn@knpn.com. Follow him on Twitter: @KNPNZinn. A local teen raised nearly $3,000 for families of children with cancer over the weekend. Benton High School student Joe Ford, 14, was diagnosed with Hodgkin’s lymphoma when he was 12 years old. He beat the cancer, but noticed that the people around him needed help. 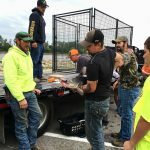 He organized the Casting Out Cancer fishing tournament last year as a way to raise money for things that families may need. “I kind of thought of the whole fishing tournament idea because I had cancer, and I saw the toll that it took on my mom and family,” Joe said. This year’s tournament was an overnight fishing event that ran from Friday to Sunday. Joe’s mother, Monica Ford, said that this year’s tournament was much larger than the inaugural one. “We had three boats last year, and we had 20 this year. So, it was amazing. I was overwhelmed with the response,” Ford said. Anglers paid $150 to fish over the weekend, $75 of which went toward the charity. The rest went toward a pot that paid $900 to first place, $400 to second and $150 to third. The $1,500 raised from sign-ups went toward a charity program that Joe is starting that will provide a basket of helpful items for families that have children suffering from cancer. “I (am) starting a nonprofit. It’s called Door 2 Floor, and it’s going to contain a basket of gas gift cards, food gift cards and things like that,” Joe said. In addition to sign-up fees, there also was a silent auction. Ford said the final numbers aren’t counted up, but she expects this year’s tournament to have raised at least $2,000 and is hopeful that it will be closer to $3,000. First-place winners Shelby Collier and Joel Roberts caught a 64-pound blue catfish. Collier said they were lucky because it was the only fish they caught. 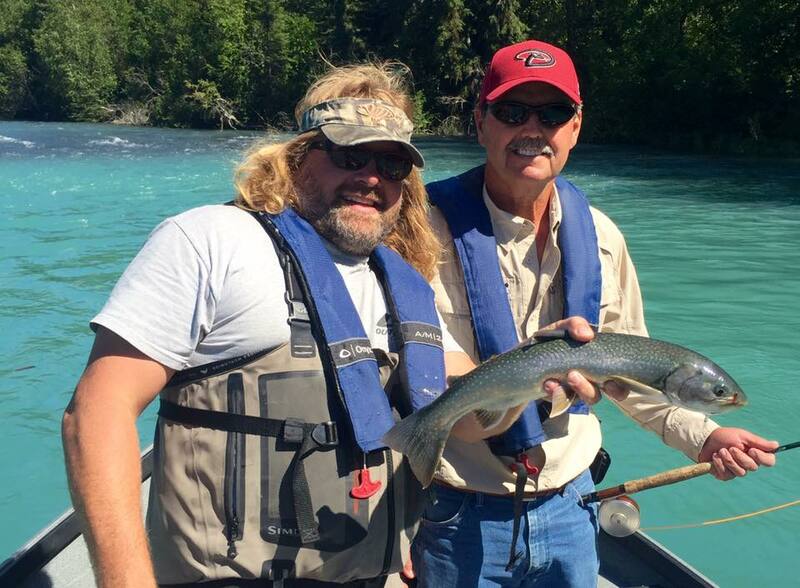 “We were excited when we got the fish in the boat. We didn’t have any other bites though, so we didn’t know what we were coming into,” Collier said. Roberts said the fish made his night. “It was a tough bite last night. So 64 pounds on a tough bite is, you know, you have a pretty good night,” Roberts said. The couple enjoys fishing and found out about the event on Facebook. They wanted to help Joe with his “awesome” idea. Joe’s mother hopes that the tournament continues to grow and said it will be held again next year. She was filled with emotion over how many people turned out to the tournament this year. “It just, it’s overwhelming, it really is. I don’t even, I can’t even put into words how awesome it is. This community is just awesome anyway,” Ford said. Brendan Welch can be reached at brendan.welch@newspressnow.com. Follow him on Twitter: @SJNPWelch. Since he was 5 years old, Brady Ballis has liked to fish. Now 18, Ballis spends free evenings at home in White Bear modifying and painting lures and building custom rods for resale. Many of the lures are tied with shiny tinsel called flashabou, made by a Stillwater fishing company where he also happens to work. The product gives his lures the appearance of live bait in the water, Ballis said and he uses it on all his muskie lures. “It was early September, my buddy Tyler and I were just going out for fun. It was going to be the last time we were going fishing on White Bear Lake. After 30 or 45 minutes of fishing I hooked the fish. At first I thought it was only a weed because it wasn’t fighting at all. Then all of a sudden the weed started to move sideways. I was only using a spinning reel with 15-pound test monofilament. 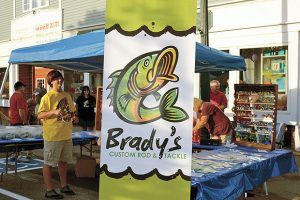 Last month, the budding entrepreneur rented a booth at Marketfest to peddle his lures and custom fishing rods. Sales were good, enough to cover his costs plus a little extra, Ballis said. 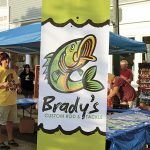 His marketing efforts are supported by his mom, who is a graphic designer and designed his logo; and his dad, who pitches the tackle to his firefighter buddies. Tom Ballis serves dual roles as a Stillwater firefighter and first assistant district chief at station No. 2 in White Bear Lake. Eventually the young fisherman hopes to manufacture his own tackle full time. Ballis’ dream is to own a store selling his lures and custom rods with classes for tying flies and building rods. If he’s not making lures, Ballis is usually in a boat fishing. He graduated from White Bear Area High School in June and plans to attend Hamline University this fall to study business. He played Junior Gold hockey and was a member of the trapshooting team in high school. Does he have a favorite fish to catch? “I love catching them all,” Ballis said. 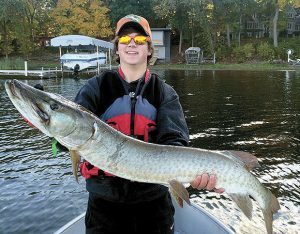 He usually fishes in White Bear Lake, which the avid fisherman said is on track to being one of the best muskie lakes in the state thanks to DNR stocking efforts. Lure prices range from $1.25 for hand-tied jigs to $5 spinner baits. Custom rods range from $100 to $600 depending on material and desired sensitivity. For now, sales are not making him rich. Any profits are usually used to buy another mold to make another lure. “As long as I can sell a lure here and there to someone, I’m happy,” he noted. Catching fish on his own tackle is quite a thrill, too. 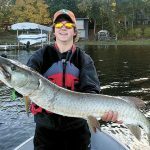 Especially a fish like that muskie: “It’s a different feeling to catch all these fish on a lure and a rod that you made yourself,” Ballis said.